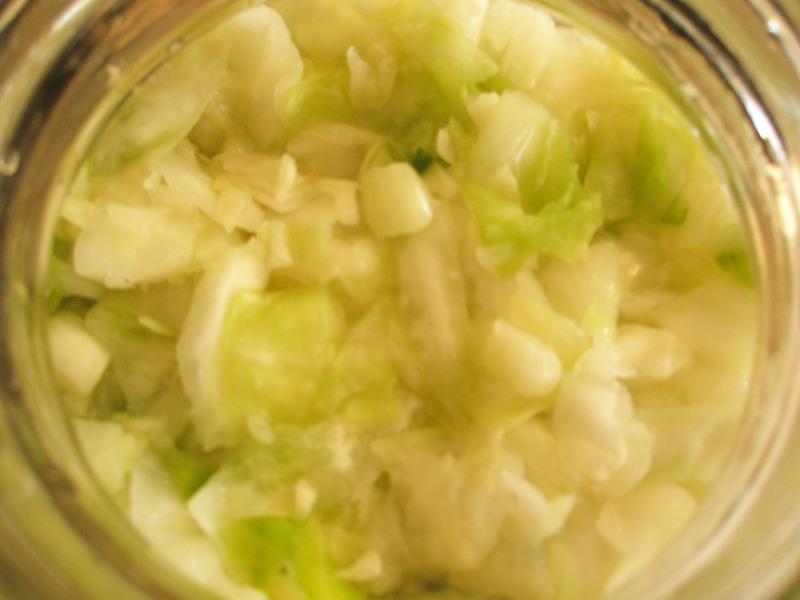 Somehow, I have not posted my ginger-garlic sauerkraut recipe yet on my blog. And, with spring cabbages beginning to roll in, I decided to whip up a batch…while listening to Sade. I think that Sade makes the lactobacilii happy (smile)…especially Smooth Operator. So, I really wish I would have been a foodie, plant-lover, and fermenter when I lived in Ukraine in 2000-2001. I would have been fermenting like wild with all of the kapusta (cabbage) that was available at the daily farmer’s market. At least Ukraine did break me of many distasteful American habits (fast food & processed foods). I guess I just wasn’t ready for ‘kraut yet. It would be years after this before I tasted my first batch of *real* sauerkraut (not that vinegar-based stuff on the shelf). After Eastern Europe, I moved to San Francisco where ‘kraut with all kinds of fixins was becoming common to find on the shelves. This was about the time Sandor Katz’s book Wild Fermentation came out. I slowly began purchasing ‘kraut, but not yet making it myself. When I moved to the mountains of North Carolina in late 2009, things changed. Living in a remote holler didn’t really provide me with the food pleasures of San Francisco. So, I started making things myself. Sourdough bread and sauerkraut were two of my first adventures. Of course, the health benefits of sauerkraut are many. Just in terms of Vit C…well it goes up exponentially when you ferment cabbage. So, I’d say reach for kraut instead of an orange when your health takes a dip. Here’s a list on the benefits of fermentation. I compiled this list from Sandor Katz’s workshop here in Mississippi late last year (and spiced it up with my own mojo). In this blog, I share my baseline recipe as well as some notes on preparing the kraut. This is my default recipe when I mix up a batch. Of course, play and experiment…there’s a lot to discover with fermentation. All kinds of veggies and herbs can be integrated into the batch. In a bowl, mix cabbage, garlic, ginger, sea salt and whey. Squeeze with hands for about 5 min to release juices. 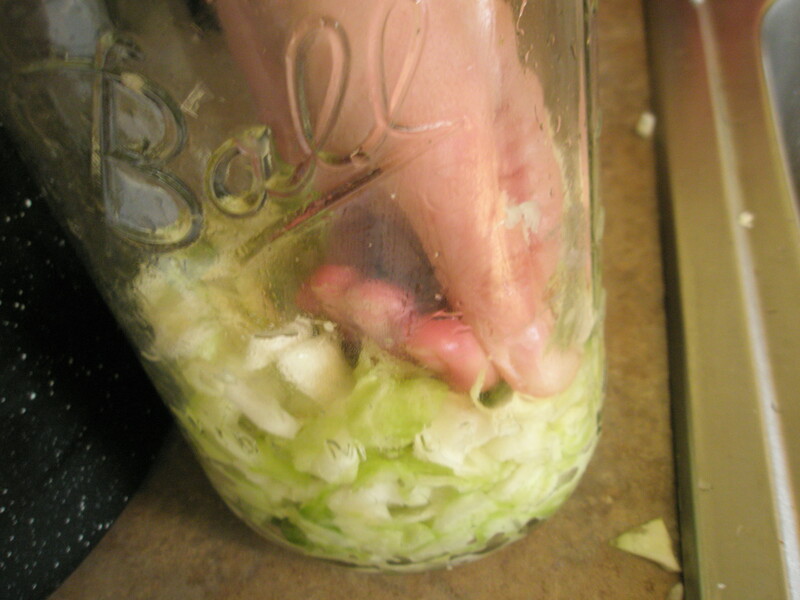 Place in a quart-sized, wide-mouth mason jar and press down firmly with your fist (or a wooden pounder) until juices come to the top of the cabbage (add a little water if cabbage is old and dry). 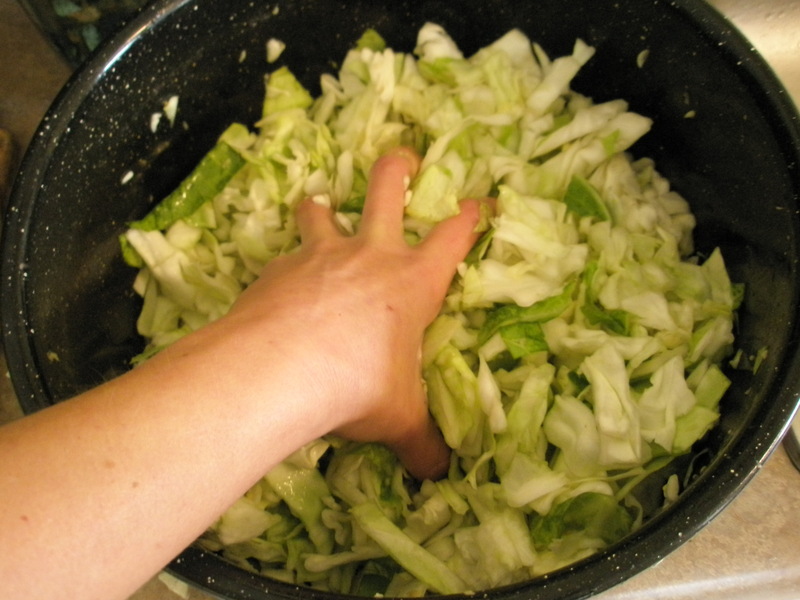 The top of the cabbage should be at least 1 inch below the top of the jar. Cover tightly and keep at room temperature for about 3-5 days before transferring to cold storage (40 degrees cool or cooler). If you used only salt to ferment, the batch can take up to 2 weeks to ferment (depending on temperature). The sauerkraut may be eaten immediately, but it improves with age. It should look about like this when you are done. Press the cabbage underneath the juice. It won’t stay there, but pack it in the best that you can. What is the purpose of the whey? Unusual sauerkraut flavouring. Liquid whey is what separates from curds when you let raw milk sit on the counter for a couple of days. As well, you can strain it off from curds when you make cheese. 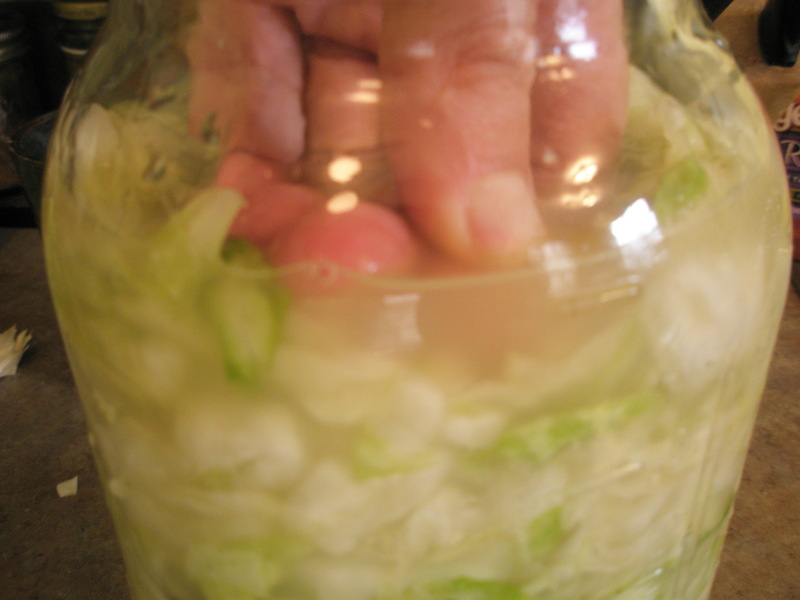 It is packed with lactobacilii which are lactic-acid producing bacteria that ferment the vegetables. 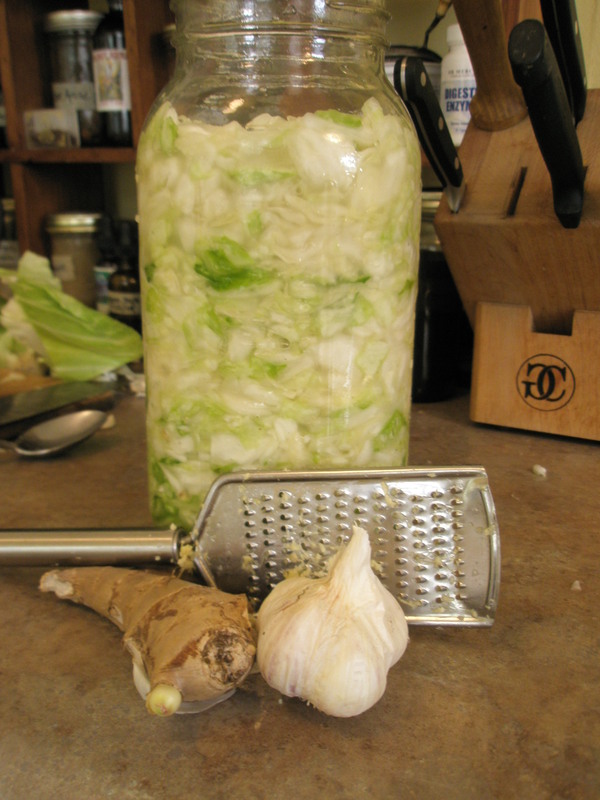 I use is as a booster so that my kraut ferments in 3-5 days. Some people just like to use salt…so that would take about 10-13 days depending on the temperature in the room. I just like using whey to activate my ferments, that’s all. Good question. I am wanting to use my ginger bug to start the ferment. would I use the same quarter cup amount as you did the whey? Great idea Cynde ~ let me know how it turns out! You’ll have to explore with the amount of ginger bug ~ but that amount would definitely be a good starting point. Well, it’s worth a try 🙂 Whey is mostly the milk’s proteins…not the fats… So, I’m not sure how that will affect the ferment. But, why not? Let me know how it turns out!